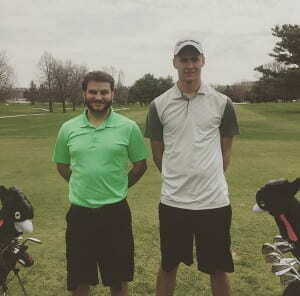 The first semesterly held recreational tournament hosted by Club Golf of UWGB at Shorewood Golf Course has concluded. Teams of two participated in a 9 hole tournament consisting of 3 holes best ball, 3 holes alternate shot, and 3 holes scramble for an opportunity to win a Intramural Championship T-shirt and sleeve of Srixon Z-star golf balls. Jackson Krauter and Cody Dohrman finished with a score of 38 (+3) and was victorias in the inagural event.